What happens when two sets of parents meet up to deal with the unruly behavior of their children? A calm and rational debate between grown-ups about the need to teach kids how to behave properly? Or a hysterical night of name-calling, tantrums, and tears before bedtime? 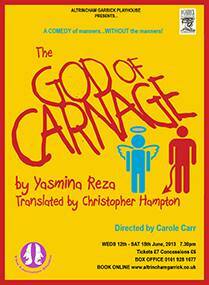 Christopher Hampton’s translation of Yasmina Reza’s sharp-edged play.